The origins of the Andorian Schism can be traced back to the secession of Andor from the United Federation of Planets in 2382, following the realisation that the UFP had been withholding scientific information that would have proven vital to remedying the reproductive crisis facing the Andorian people. The Tholian Assembly, a member-state of the Typhon Pact, exposed the Federation as concealing this information from the Andorians, revealing that they would offer the same information to the Andorians in return for friendship. Following attempts by hardline Andorian organisations to rid themselves of the Starfleet they felt had failed them, following both the Borg Invasion and biological crisis they are facing, a referendum was held concerning Andor's membership in the Federation. By a small but clear margin, it was decided that the Andorian Empire would leave the United Federation of Planets to seek a closer relationship with the Tholian Assembly, and ergo the Typhon Pact. The following years saw the Tholians and the Andorians becoming more politically intertwined with one another, each augmenting the others' forces in Andorian space, as greater numbers of Tholian shards demanded passage through Federation space to reach Andor and her worlds. Not seeking a war, the Federation Council permits this, but both Starfleet and the Klingon Defence Force increase their presence along Tholian and Andorian borders as a matter of security. 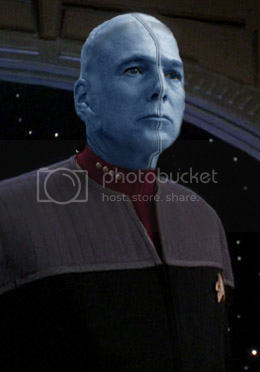 In 2384, a new Chancellor of the Andorian Empire is chosen, Kolevishras th'Kelemor (see right-hand image), the former deputy chancellor and once a member of the Imperial Guard, Starfleet and the Maquis at various points in his life. Despite rumours of his close ties with the Tholians and having the previous chancellor assassinated, Shras Kelemor is elected and becomes the new presiding guardian of the Empty Throne. With the Tholians, he is quick to establish a power base and increase propaganda about their brothers from the Assembly. The government is careful to scale back what information and progress is made concerning the reproductive crisis and the research into it, whilst Chancellor th'Kelemor continues to play his game in the parliament, finally writing up the Imperial-Assembly Concordat in late 2387, and ratifying its final elements in mid-2388 with the Mutual Cooperation and Alliance Act, which formally allied Andor with the Tholians and Typhon Pact, reforming the Andorian Empire into the Imperial Andorian Concordium. It was this very piece of legislation that led to the opposition in the Parliament Andoria being deemed an illegal organisation, forcing the shadow government into exile. Thus began the Andorian Schism. Having become long disillusioned with the running of the Andorian Empire in recent years, the colony world of Weytahn eagerly welcomed the opposition government, led by Shadow Chancellor Thy'lek ch'Narva (see left), a young, brash and outspoken figure in Andorian politics who - despite his many flaws - was a very charismatic leader who drew others to his cause easily, winning over both the Vulcans and Andorians who had settled on Weytahn (named "Paan Mokar", by the Vulcans) over the past three centuries. Heralding him as their true leader, ch'Narva's exiled opposition was joined by the local government, led by Vulcan Administrator V'Lar, in defiance of the Concordium. In response to this perceived rebellion, Imperial Guard and Tholian shard vessels were sent to defeat the exiles before they could properly organise themselves. However, a vast majority of the Imperial Guard vessels turned on their Tholian allies as the Battle of Weytahn ensued. Despite this, the tide of the battle only truly turned when a force of 'independent' Vulcan vessels entered the system on the side of the Andorians, pushing back the Tholian force to Concordium space. Immensely impressed by the Vulcans' aid, some of the local Andorians paired themselves with the Vulcans, using the phrase "Mokarian" for both sides, although it is often just more associated with the Vulcans of Weytahn. Deciding to legalise the alliance between the former Guard ships, the opposition-in-exile (often referred to as the Empire-in-Exile) and the Vulcans assisting (as well as those 'native' to the planet), the Administrator V'Lar, Shadow Chancellor ch'Narva and Imperial Guard General zh'Ralas formed the Weytahn-Mokar Confederacy - a direct opponent to the Imperial Andorian Concordium. This is regarded as the start of the Andorian Civil War. Under extreme pressure from many mainstream Federation worlds, such as Vulcan (who was the first to both recognise the Confederacy as a sovereign state and send aid in the form of 'voluntary civilian' vessels), the Federation Council receives the WMC's petition for protectorate status with hesitation. Despite a clear wish to aid the Andorian peoples, most are cautious about aligning themselves with a world in a direct war with the Typhon Pact. Federation involvement could threaten to start an outright war between the two superpowers, but whilst the Council continues its discussions, it approves Starfleet intervention in the form of humanitarian aid, and as a first response should the Typhon Pact make a first strike during the chaos. Task Force Omega, a task force set up and headed by Commodore William Morgan, is given leave to dispatch a task group of seven vessels to Andorian space, rallying at the planet of P'Jem to organise themselves in what has been named "Operation Warden". These vessels, led by Task Group Commanding Officer Captain Mot Haro (see left), a veteran of several wars and conflicts in Starfleet's recent history, ranging from the Cardassian Wars through the Dominion War and including the Borg Invasion of 2381, are tasked with rendering assistance to beleaguered citizens of either Andorian nation, should they request the assistance, but are ordered to avoid entering the conflict for whatever purposes, save for the defence of their own vessels and crew, and innocent civilians. Assistance to Andorian vessels is only be to given in the cases of emergencies, such as warp core breaches. By assigning the USS Ford under Captain Timothy Clarke, it was hoped to win the hearts and minds of the Andorian scientific community through his and his crew's extensive work with the metagenome related to the reproductive crisis, whilst the other vessels are deployed as lifesaving measures and defensive precautions. Following the Federation Council's decision to accept the Weytahn-Mokar Confederacy as a protectorate of the UFP, Starfleet and forces allied within the Khitomer Accords were given leave to join forces in the defence of the Mokarians and their newly-formed nation. However, due to the Imperial Andorian Concordium's own allegiance to the Tholian Assembly (and by extension the Typhon Pact), a war by proxy turned into the first full and direct conflict between the two power blocs of the Alpha-Beta Quadrants. Due to its proximity, Task Group Warden was the preliminary primary fighting force for the Starfleet forces during the fighting, although other vessels soon joined the fray. Under immense pressure from their superpower sponsors, who had no wish to be in open conflict with one another at this point in time, the two Andorian nations agreed to meet at the table following the short but incredibly bloody war that had gripped the once unitary state. 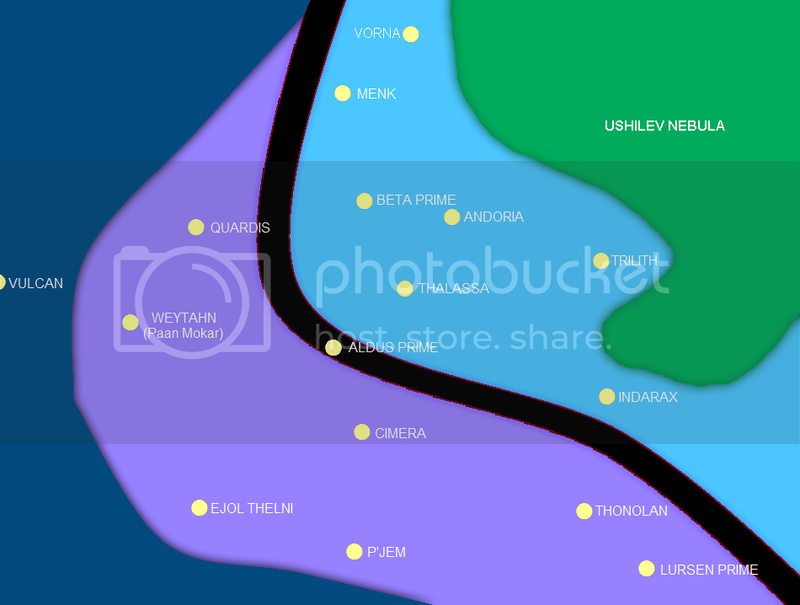 The planet of Aldus Prime, approximately halfway between the capitals of both nations - and relatively unpopulated - was chosen as the neutral ground for the peace summit, with representatives from both sides, as well as other observers, meeting to find common ground to end the fighting. On the 26th August 2388, stardate 65651.8, the delegations met at the Therin Building on Aldus (henceforth named Camp Therin) to discuss terms of an armistice. The building was divided into two separate wings, one for the IAC delegation, and one for the representatives of the Confederacy, almost exact mirrors of one another. Speaking on behalf of the IAC was Chancellor th'Kelemor himself, supported by Kazrene, the Tholian Ambassador to Andor and Field Marshal Kolithrane th'Thalmor, formerly a general and a replacement for the commander-in-chief of the Imperial Guard who joined the Confederacy: General Salavali zh'Ralas, who sat alongside Shadow Chancellor Thy'lek ch'Narva and Administrator V'Lar on the opposing side of the conference hall. The man who presided over the Aldus Summit was Ambassador-at-Large Sennek, a Vissian diplomat who was admitted by both sides to be the most qualified individual for the job, and who had experience in the Cardassian Wars, served in two President's cabinets, an ambassador to the new Reman nation, a signatory of the Third Khitomer Accords and special Envoy to the Andorian People following their secession in 2381. Whilst a native of the Federation, even the Typhon Pact acknowledged his ability, as well as his past with Andorians and Tholians and permitted him to serve as the chairmen for the debates. The Summit itself was filled with angry words, hot heads and insults, with Shadow Chancellor Narva proving himself a stubborn and difficult man to side with, as the Federation and his own allies urged him to be more reasonable in their dealings with the IAC. After reasonable terms had been decided by both sides and it seemed likely an agreement would be made, the Shadow Chancellor refused to accept the deal, forcing an end to the first day of discussion, and playing right into the hands of the Concordium's media. It also caused a significant strain on the Mokarian administration in their earliest hours. However, by the next day, a message from ch'Narva's office and staff had him rescinded his previous comments and agreeing to the terms laid bare in the previous session. However, when the time came to sign the legal document, the Shadow Chancellor chose not to appear, instead permitting General zh'Ralas to take his place as the signatory. The events surrounding this change of heart are unknown, but from this day forward, Thy'lek ch'Narva's attitude crumbled, and his popularity fell as he struggled to maintain his hold and confidence. Beta Prime, one of the largest agricultural and industrial centres of the Andorian Empire, is ceded by the Weytahn-Mokar Confederacy to the Imperial Andorian Concordium. Cimera III, a planet housing one of the primary research centres for the Andorian reproductive crisis, is placed under WMC control. Any Cimeran scientists wishing to return to Imperial space are permitted to do so, and the Weytahn-Mokar Confederacy pledges to share any substantial research conducted at the facility. The enlisted crew of the captured MDV Thalisar (now once again the "IGV" Thalisar) are permitted to return to Confederate space following routine punishment for their betrayal, whilst the commissioned officers of the vessel will remain prisoners of the Empty Throne. An Andorian Neutral Zone will be established along the border between the Confederacy and the Concordium, running through the neutral planet of Aldus Prime, which is then named the "Aldus Line". In the interests of future cooperation and dialogue, Camp Therin is declared the Embassy of Two Worlds, and will be a neutral site supported by an equal amount of vessels from both sides where delegations will meet at set times to discuss matters of Andorian importance. Armed conflict between the WMC and IAC will cease, and neither side will be permitted entrance to the other without prior consent, including all civilians or allies from either side unless otherwise stated.